(I have an opinion but opening it up for yours). Then we can name the episodes or scenes where Jack and Sam clearly have a thing for each other - more than their professional relationship. (And, if anyone has screenshots of appropriate scenes please post them too - I don't have the ability to do that (at work) so thanks in advance for that effort). This is a big topic. I read somewhere that there was outraged viewers letters, as the relationship between the two began to grow something about the professional beyond (This need not be true, but is quite conceivable). Fortunately, people have different tastes and preferences. Everyone can interpret anything into it for themselves in almost every episode, of which only he is convinced (I'm also the only one convinced that Jack Lairas wish could be fulfilled by a child by him) . I see more than just friendly feelings or merely the concern for a member of his team. For me also Jack's and Sam's bantering are full of clues. Jack's behavior and reaction in 'Threads' in the interview with Ms Johnson in his office speaks volumes for me. When I want to have detected the first time a sparkage between Jack and Sam ... I have to go again in me. But certainly it was in the first season. But as I said, everyone has their own interpretations . Agreed that there could be some indications of a budding relationship between Jack and Sam in many of the episodes. And, yes, it started right there in Season 1. Broca Divide (a picture would be nice) in the locker room when Sam basically attacks (seduces as Jack calls it later) him.....that is clearly indicating of some love - or lust - for Jack by Sam. That scene might have sparked some letters of protest but I thought it was a great scene. And Jack saying, "not like this" showed he wanted Sam but just "not like that." And then later in that episode when Jack asks Sam about her knife wound leaving a scar = and that he was "concerned" because if it left a scar she would never wear that cute little top again.....well....it speaks of Jack's feelings for Sam right there. So the "sparkage" was early on. I'd just like to highlight some of the episodes that clearly show it. And maybe others can post the screenshots that go with these episodes....that would be nice since I can't do that (at work). Kti wrote: Thank you B.
I meant to say - thank you for that picture from GRACE - is it?. YES - Jack is showing definite "missing" of Sam in that scene and just in the way he looks and takes his hat off - so convincing of his missing of her. 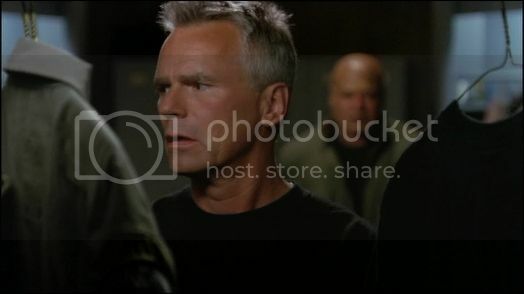 And, yes, Teal'c definitely senses the sorrow in Jack's heart. What a heart tug he gives in just those small actions and looks. Now this is funny B.! In 'Broca divine' I know not even a small sparks for me . An impressive scene in locker room (Jack as always delicious)! That with the tank top I have only registered a smile. Kti wrote: Now this is funny B.! In 'Broca divine' I know not even a small sparks for me . An impressive scene in locker room (Jack as always delicious)! Oh, wow, kti - yes those are the pictures I was hoping to see. I love that scene even if Sam is not "sane".....it is a "delicious" scene as you say (Jack being the delicious one.... ). Agree with you that this doesn't really rate their emotions for each other = except that Jack says "not like that" when asked, "Do you want me?" by Sam. In other words, he wants Sam but not with her being crazy like that - or with her "attacking" him like that....but I can see where you wouldn't give their relationship any credit at all in this episode. It's from "Fire and Water" when they believed that Daniel was dead because of kind of hypnosis. I think there are many emotions when he hugs her but first of all a deep wish to make her feel better. Yes! Darling - thank you - that is exactly the scene I mean....and thanks for refreshing my memory about what it was about - why Jack was hugging her. I did not recall the reason for the hug but now I do. Wow thank you, darling! 'Fire and Water' I had now not on the plan! I'm still by your incredible works of art entirely by the wind! Thanks for the freshening images . Now I stand on the hose! I found this picture and can not remember this scene . Actually, it must be based on the Stargate questions topic but somehow here.